People who study dogs generally agree that dogs evolved out of wolves, not the jackal as some had once thought. The story goes that wolves gradually insinuated themselves into the camps and caves of primitive human beings, drawn by food and warmth, or were invited in to provide protection. Were they invited or did they invite themselves? Probably both. It certainly was the case with Roxie. 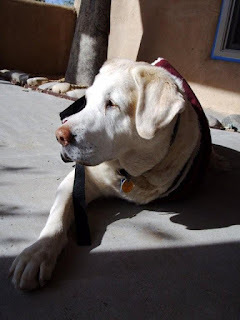 About six months after our black lab, Flora, had been put down because of kidney cancer, our veterinarian, Dr. Michelle Brennan, in California called to say that she had unusual lab for us, one that she had rescued, and asked if she could bring her by our house. Her previous custodians had planned to put her down because she had only three legs. After sniffing each other out, she stayed for 15 years. She came to the house and wanted to come in, and we invited her in, all of it simultaneously. The unspoken agreement between the dogs and human beings is a trade-off, protection for food and warmth. 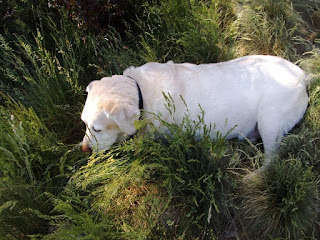 Now, Roxie, a yellow lab, wasn’t much of a protector anymore although she did bark when someone came to the front door. In human terms at 16 she was about 112 years old. She didn’t walk on her own anymore, slept most of the day, and possessed a beautiful smile. 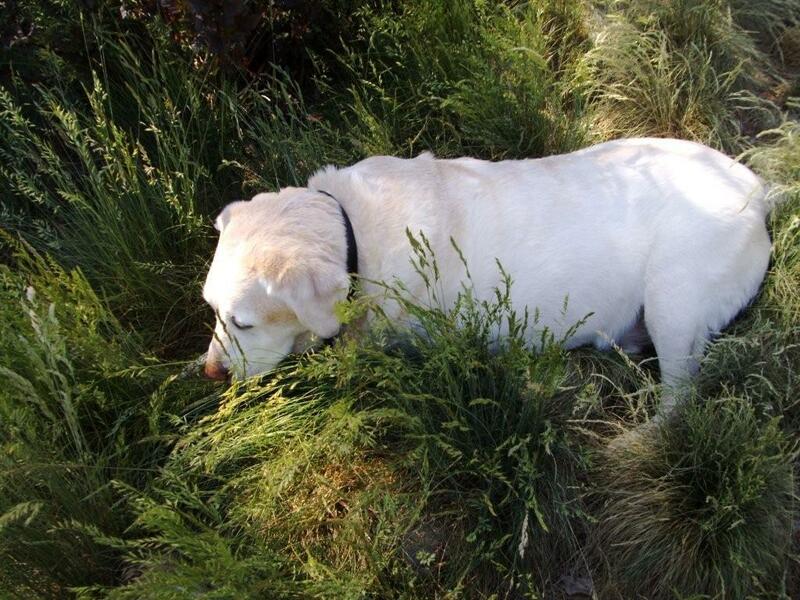 With her luminescent pink snout aglow, she always greeted us with a wagging tail, barks of joy, and smiles. You can’t say that for every loved-one and friend. With Roxie it was every time. That’s worth a lot, especially nowadays in such a bellicose society as ours. Some have asked why we didn’t put her down earlier. She was in good health and happy until the last few days which brings us to another, more important reason, that we invite dogs into our houses. They bring us joy. They’re great companions. We play with them, take them for walks, and simply enjoy their comforting presence. Roxie was an in-house therapy dog. She was a pleasure, especially her large soulfully hazel eyes. Stroking her, she drew out stress and anger, replacing them with ease and bonhomie. She was at our sides on her pad in front of the fireplace as we either watched television or read. I passed her bed every night as I went to bed. After my prayers, I always paused to stroke her and kiss her good night, more for me than for her. Although many may disagree, Roxie had a soul, just as did Flora. Souls can be seen in the eyes which I am told are windows to the soul. After eighty-six years, I have come to a sadness. Not everyone has a soul because some people had traded them, just as did Faust, for something of lesser value. It can be seen in their eyes, the eyes of a snake, blank. We have fancy words for these transactions involving power, privilege, money, lust, and other tawdry goods: sociopath and psychopath. It’s a trading down. Dogs are good at assessing people because they don’t get entangled in the contents of communication. Some studies have shown that 87% of communication is in gestures, expressions, and tones of voice. Thirteen percent is in content. Human beings clog their brains with content and often ignore the real forms of communication. Roxie didn’t. Communication other than personal is unreliable and unsatisfactory, automaton like. Roxie was a whizz at assessing people which is another reason to believe she had a soul. I feel sorrow for people who don’t like dogs and despise people who maltreat dogs. Dogs with souls are far more rewarding companions than human beings who have traded their souls for the tawdry. We grieve in the emptiness of Roxie’s passing, and in our evening prayers we pray for her soul in her passing. All in all, the greatest gift of dogs is that they humanize us.